You will be once you check out the program for Plastics Technology’s Extrusion 2016 Conference. Registration is now open to the premier annual event devoted to all things extrusion. Plastics Technology’s Extrusion 2016 Conference will be held Dec. 6-8 at the Le Méridien Charlotte in Charlotte, N.C. It’s PT’s second annual all-extrusion event. Last year’s was a barnburner, with more than 350 attendees. We’re expecting a bigger crowd this year, and have upgraded the accommodations accordingly. You can check out the agenda by clicking on this link. You’ll be able to investigate the various topics that will be covered, as well as the speaker and his or her background. 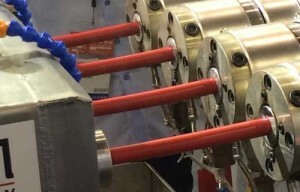 You’ll notice that this year’s conference—like the one held in 2015—combines General Extrusion sessions with tracks that drill down to your specific process. The program kicks off the afternoon of Tuesday Dec. 6 with a General Extrusion session. Another General Extrusion session will be held the morning of Wednesday Dec. 7. Then after lunch, four concurrent track sessions will be held on Compounding, Film, Sheet and Pipe/Profile/Tubing. The program on Thursday, Dec. 8 is set up the exact same way as Wednesday. Over the course of two-and-a-half days, you’ll have access to more than 80 presentations and a tabletop exhibit area featuring more than 50 of the extrusion industry’s leading suppliers. I’d advise you to please register now as slots will fill quickly for this unprecedented networking event. Pricing details are available here. To register, click on this link. And lock in your hotel room now here to avoid being shut out.